UK singles sales grew by 33% in 2008 thanks to a growth in download sales, the BPI has said. Figures from the body, which represents record labels, showed more than 115 million singles were sold across digital and physical formats. 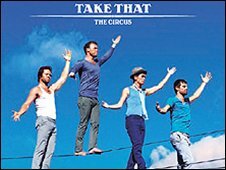 Releases from groups like The Killers, Girls Aloud and Take That also helped the album market finish the year with stronger than expected sales. However UK albums sales generally fell by 3.2% in 2008. The digital albums market grew during strongly over the year with 10 million sold - a 65% increase compared to 2007. The format now holds 7.7% of the albums market as a whole. But Mark Sutherland, global editor of Billboard magazine, told the BBC News website that overall decline in album sales was not wholly bad news. "In the context of the world, declining just 3.2% is a pretty remarkable result - in the US, album sales for the whole year are down 14%," he said. "We had been looking at a 7-8% decline but were not expecting a significant improvement. "And with sales over the Christmas shopping period actually up year-on-year, it is fairly unprecedented." Figures are down in unit terms for albums so will be down for value too. Sutherland said that taking into account the problems UK retail environment suffered recently, it was "little short of a miracle" for sales to be up year-on-year. "But it was a much stronger release schedule than it was last year which helped," he added. The BPI said that strong demand for new releases meant that although the physical supply chain had suffered due to retailers such as Woolworths and Zavvi being hit, sales had migrated to supermarkets, digital retailers and online stores. "Every business and consumer in the UK is having a tough time, and these difficult trading conditions make the resilience of the UK's music market all the more notable," BPI chief executive Geoff Taylor said. The BPI's figures are based on sales in terms of volume of units sold. But as singles and albums now cost less to buy than they used to Mark Sutherland said it would be interesting to see value figures when they are released. "Figures are down in unit terms for albums so will be down for value too," he said. A BPI spokeswoman told the BBC News website that sales in monetary terms would not be known until later in 2009. Meanwhile, the UK's Entertainment Retailers Association (ERA) said its members sold more DVDs, games and music combined than ever before, up 4% on 2007 to a total of 485.8 million units. The fastest-growing sector was computer games which showed a 17% rise in unit sales to 82.8 million, led by the popularity of the Nintendo Wii. While DVD sales grew 1.9% to 252.9 million units and high-definition Blu-ray formats, jumped 358% to 3.7 million.